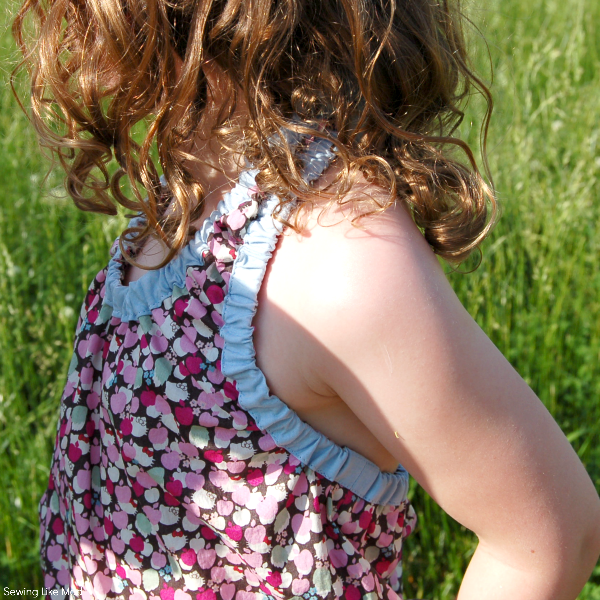 Ohhhh, today I have one of my new favorite patterns on the blog. 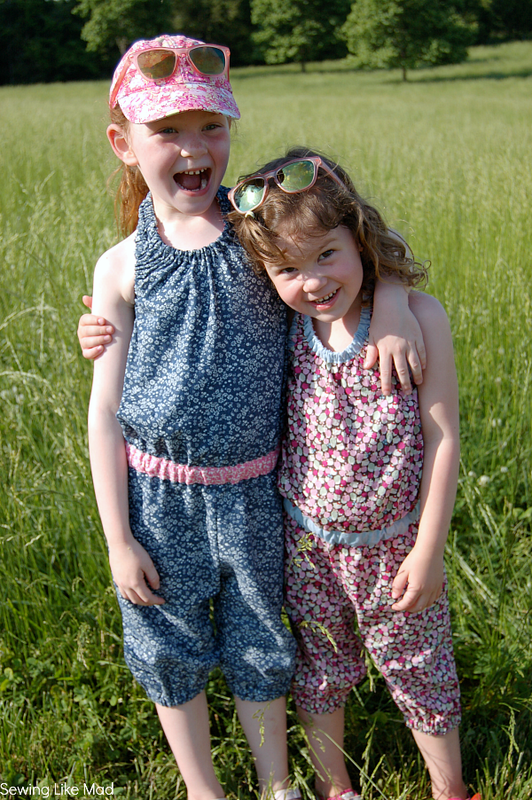 The Ash jumpsuit from Willow & Co - designed by my lovely and mega multi talented friend Celina from Petit a Petit and Family. It might seem a bit overwhelming to sew a jumpsuit - the fit has to be right because otherwise it simply won't work....and guess what? The fit is perfect - roomy yet fitted at the same time. THAT is a hard balance to find so kudos to you Celina. 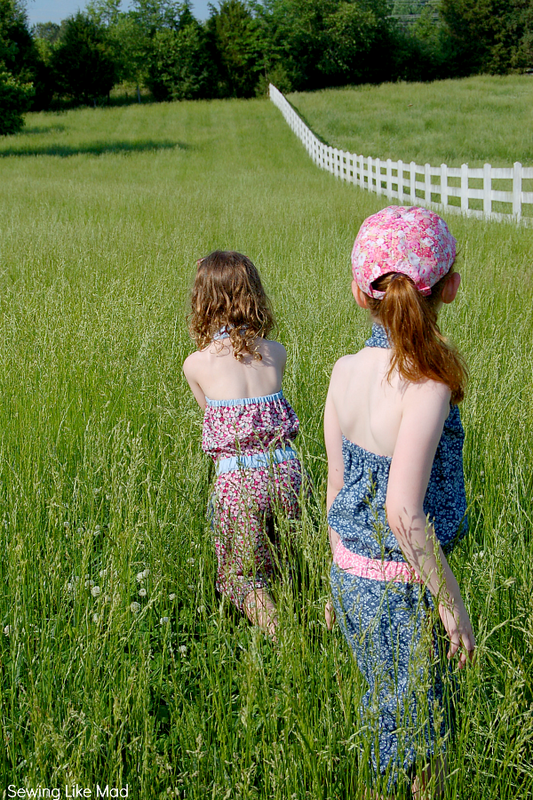 My girls LOVE their jumpsuits but more about that later. Even though it might looks slightly complicated there is actually not a single difficult technique involved in this. The hardest part might be to close up the facings/elastic casings and Celina is giving you three choices how to do that in the tutorial - depending on your skill level (or sewing personality, ha). On Evelyn's jumpsuit I choose to make the facings/elastic casings visible. It does not require any changes to the pattern....just a matter of sewing them right against wrong, instead of right against right. The fabric is this very subtle Hello Kitty for Liberty Fabrics. I guess you can call it a parent/child compromise print. The blue cotton voile ties in with the blue flowers on the Liberty print. The fabric I used for Wilma's is this aaaaamazing (and kind of pricey - around $18) thin, soft cotton denim with a tiny bit of stretch and small white flower print from Hancock Fabrics. The lady at the cutting counter looked at me for a looong time to be sure I really wanted it after she saw the price, ha. And I really did! There is a little bit more sewing involved than the average garment but it can all be done in a fast tempo. A super fun sewing project actually. Which was lucky for me because I had to make two right after each other. Something I rarely do. Yeah, I am lazy like that and I get easily bored doing the same things over and over. Some of you might already have read about this little incident on my Facebook page. I finished Wilma's size 6 and wanted to try it on Evelyn, who is 4 years old but kind of same size as her sister - except in height of course. So I figured if I one day wanted to make her one I could just shorten the size 6 pattern that I had already traced (yeah, I will do anything to avoid tracing patterns). BUT what happened next was that Evelyn flat out refused to take the jumpsuit off. Just plain NO! So I literally had to go back to the sewing room, start finding fabrics, cutting and sewing another one. And she is now a very happy bunny....even though she (of course) refused to try the new one on when that was done. Arghhhhh kids!!!! Luckily that did not last long and since photo shoots always involved treats and now also a flat $1 payment she gave in. I give this pattern my warmest recommendations! And so can my girls. They both wore their jumpsuits to preschool and school (with sort of tight t-shirts under) today and when I picked up Evelyn she said: "Mom, everyone was so nice to me today." Oh, that's nice, why was that?" "They all said I looked good in my jumpsuit." 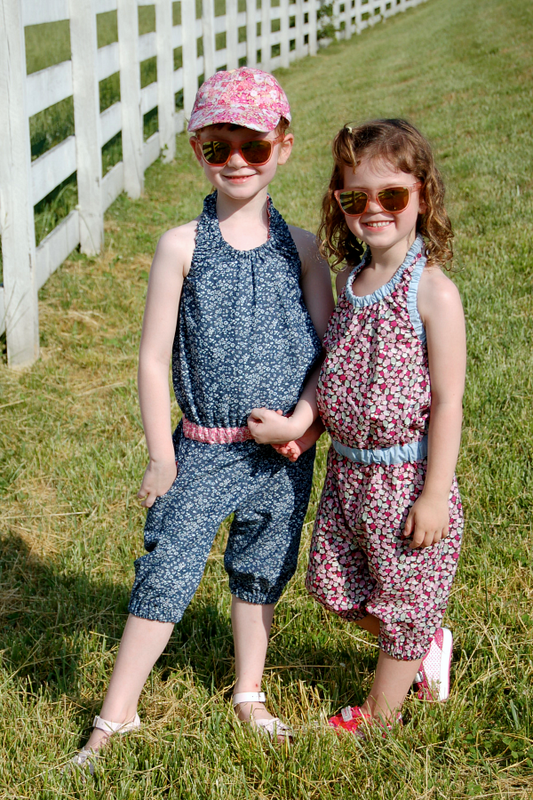 The Willow & Co Glamping Tour is going on at the moment and several of the participants have made this jumpsuits - all with amazing results and rave reviews. Jess - Me Sew Crazy, Alida - Alida Makes, Tara - Girl Like The Sea, Alexia - Lexi Made, Chelise - Chelise Patterson. If you are still a bit scared to make a jumpsuit (even though you really shouldn't), the pattern also have a separate top and pants option....that might be a good place to start. 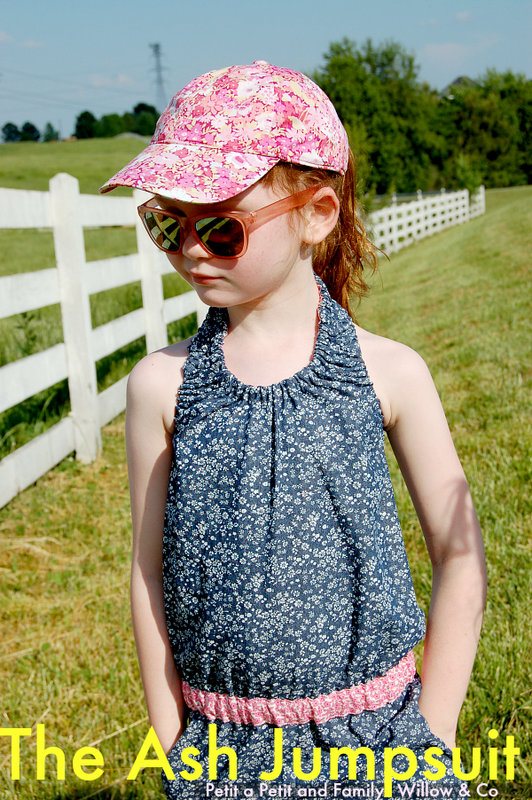 Separates can also be practical for the younger ones. And the result is just as cool. Just look at this post from Heidi & Finn or this from Do Guincho. 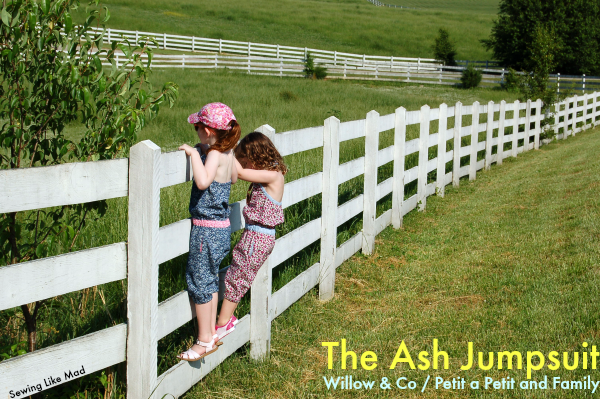 You can get your hands on your own Ash Jumpsuit pattern HERE. i love them mie! that last picture is too cute! Ahhh!!! Sooooo cute!! Your girls are adorable! The jumpsuits are perfect. I love this pattern!! Super super cute! The fabric is great! I wish Ania would wear a jumpsuit. I guess I just ahve to make separates. :) The length is perfect for summer too!